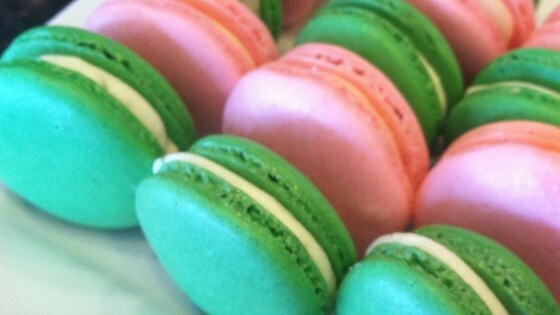 "This is the quintessential macaron (NOT macaroon) recipe. I am a baker's apprentice, and after much trial and error, we (the baker and I) finally perfected the technique. We decided to share with you all. Pipe your choice of filling on a cookie and sandwich another cookie on top. These are like cloud cookie sandwiches and are delicious if done correctly. If you want to do it the super-easy way, just fill with your favorite flavor of frosting. Enjoy!" If you do not have a sifter, you can use a blender or food processor to thoroughly mix the almonds and confectioners' sugar. Just blend or pulse for thirty seconds. Remember that because the consistency of the mix is like cake batter, you're going to have to be quick about piping it onto the silicone mat. Hold the pastry bag sideways between piping so it doesn't spill. This is my third macaron recipe, and FINALLY, I got lift and feet and no cracks, but ONLY after I bought a scale and weighed everything. Volume measurements didn't work for me at all.